World number four Rafael Nadal does not know when he will be fit to play tennis again, but insists he has "plenty of years ahead" in the sport. The 11-time Grand Slam champion is recovering from a knee injury and has not played since Wimbledon in June. He is currently sidelined with a partial tear of the patella [kneecap] tendon and an inflammation of the Hoffa's fat pad [soft tissue behind the patella], and was forced to miss the Olympic Games and the US Open. It remains doubtful whether he will be fit for the ATP World Tour Finals in London or Spain's Davis Cup final against the Czech Republic, both in November. Nadal's last match was a shock five-set defeat by Czech world number 100, Lukas Rosol, at Wimbledon on 28 June and he has yet to return to the court as he continues his rehabilitation in the gym. Nadal has struggled with knee problems previously and was unable to defend his Wimbledon title in 2009 because of tendinitis. This year he reached the Australian Open final in January, before winning his seventh French Open title in June, and aims to be competing for another Grand Slam title in Melbourne in the new year. 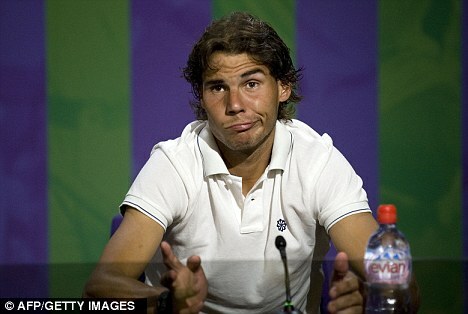 OH I really hope Nadal comes back and makes it to the Australian Open. I have already booked my tickets from travels with Soha. So if he comes back it would make it extra special! Thanks so much for sharing this!